I don't have anything bad to say about this rod. I recently acquired this rod from this site about two weeks ago along with size 3 Sunline level line and the recommended 6.5X tippet. I chose the fluorocarbon tippet. Caught a bunch of sunfish and some small bass on it already. It's a hoot!!! Beautiful looking, super lightweight and easy to cast. Great rod, can't wait to get it to the spring creeks I fish in in New Mexico in October. Should be a blast catching trout on it. This rod is a great addition to my collection. 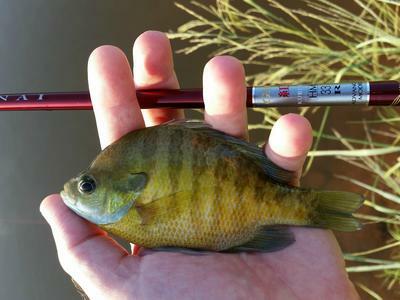 You are correct, it is a great light weight rod. It can manage larger fish. I caught a 13" large mouth last spring and it was a hoot trying to land him. The rod is very strong for the weight. This past weekend I was in New Mexico and fished with the rod. Did great! I caught many browns and rainbows with it. It definitely has it's limits. I hooked into three very large rainbows, 17" plus, and each time they broke the tippet. Now I wasn't specifically fishing for the large fish but what can you do, except hold on, when of them takes the fly! For all the other fish, which ranged from 4" to 12", the rod was perfect! I had no problems controlling the fish and it was fun to boot! On one of the days I switched to my Nissin Royal Stage 400 6:4 and man did that thing feel heavy!!! It took a bit to get used to the feel of such a "heavy" rod!!! 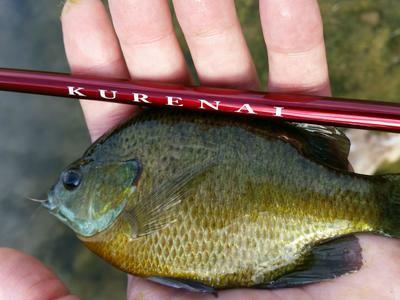 The Kurenai is definitely becoming my favorite rod to use.